stir-fry the dense or strong-flavored veggies like onions and carrots first, adding more delicate veggies (peppers, mushrooms, bean sprouts) close to the end of the cooking time so that they will stay crisp-tender. Toast sesame seeds in a dry skillet over medium heat for a few minute, stirring frequently, until seeds turn medium brown. Set aside. Combine sauce ingredients in a medium pot. Bring to a boil, stirring frequently until sugar and cornstarch have dissolved. Cover and remove from heat. Lay coated chicken cubes on a greased broiler rack that is set over a drip pan. Broil in oven 4-6 inches away from the element for 5-8 minutes, until chicken is cooked through and top of chicken has some nicely browned bits. Remove from oven and toss with sauce. Cover and set aside. 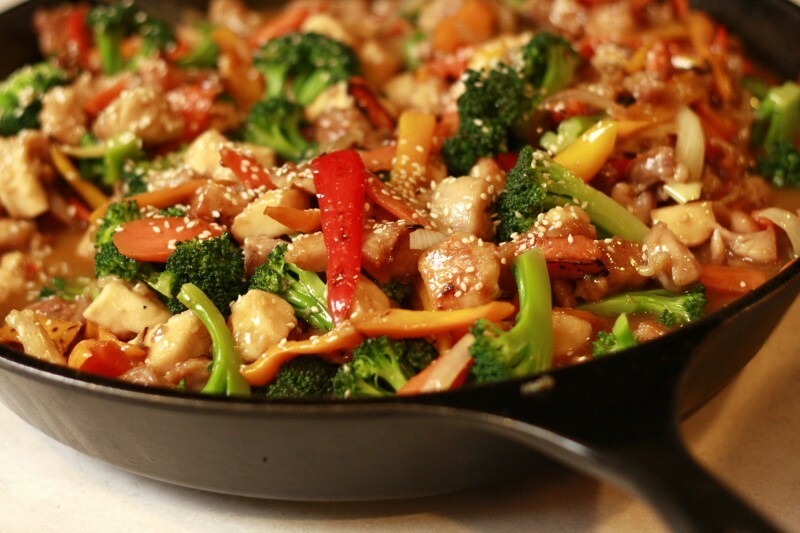 Add 2 tablespoons of sesame oil to a large heavy skillet set on high heat. When oil starts to shimmer with heat, add onion and carrots. Stir fry 2-3 minutes without stirring, or until veggies get some nice brown bits. Add broccoli florets.Stir and cook for another couple minutes to continue browning. Add sliced peppers and cabbage and cook for about 5 more minutes, until veggies are crisp tender, stirring a couple times. When veggies are cooked, add chicken and sauce into the veggie mixture. Cook a few more minutes, until veggies are well coated with sauce and all ingredients are hot. Top with browned sesame seeds. Serve over rice. Mary it might be my computer set up but I get a 404 error message when I click on the Sesame Chicken and Veggies link. It looks DELICIOUS! Hi. I’m getting an error, too when I click on the link. Thx! It works for me! As soon as this morning sickness passes I will be trying some! The link is working for me. It looks delicious! Yummmmm! that looks YUMMY! But that pan could not have fed your whole family….could it??? Just got your Family Feast book from Amazon today. I’m so excited. I can’t wait to sit down and go through it. Looks yummy! My kids will eat everything in it too. Hubs, not so much. Maybe we can fix him some thing else or as my mama used to say if you don’t eat it…STARVE!